***This review is spoiler-free! There is only one plot-point exposed, but it’s literally the opening scene of the game. *** It’s not often that horror games tread on the Adventure genre as it applies to the point-and-click variety. Hugo is one of the earliest horror adventure games I can remember. But that’s over 20 years ago and in that span of time I can only think of a handful of titles to apply the horror element. 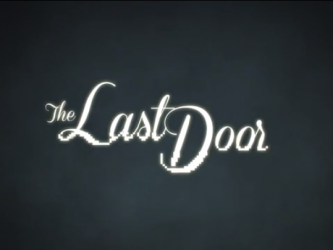 The Last Door is an episodic flash-based game that was successfully funded on Kickstarter in late December of 2012. Currently only two episodes are available and, more specifically, my review of the game centers on the both of them. There is also an interesting payment model. As far as I can figure it, the penultimate episode will always be free. Meaning, when episode three comes out, episode two will be free and so on. If you want to play the current episode now, it’s a pay-what-you-want model. Overall, it’s extremely fair no matter which way you look at it. 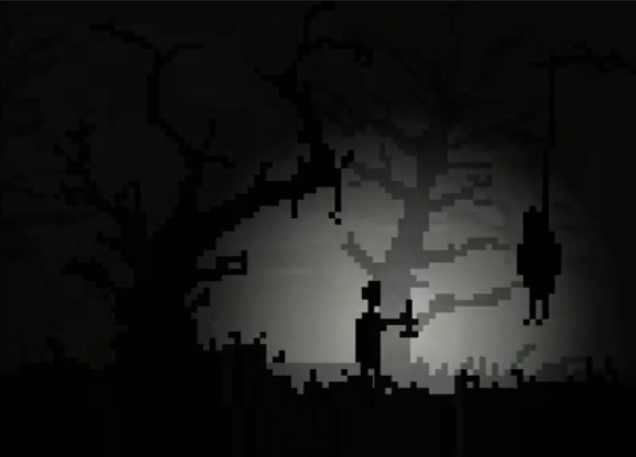 Visually speaking, The Last Door makes use of a decidedly retro lo-fi artistic style. If you were to take something along the lines of an Atari 2600 and 8-bit Nintendo, but increased your color palette beyond the limits of what those older generations allowed, what you’d see is The Last Door. Juxtaposed against those lo-fi visuals is a bombastic (in a non-pretentious way) hi-fi soundtrack. 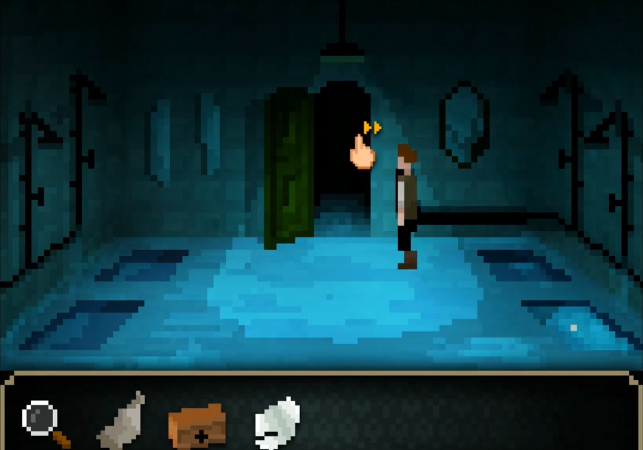 From the intro music to the unnerving old gramophone records, the music and sound effects behind The Last Door managed, on multiple occasions, to keep me so on edge that my apprehension could cut like a knife. I'm really diggin' that top hat. The arrangement of audio/visual elements, to what is essentially a straight-forward adventure game, manages to assist in distilling the pure essences from both the Adventure genre and the Horror sub-genre. Only once during my play-through of both episodes was I stumped for a moment. And I was only stumped because of an exploration problem, not because of a puzzle. Generally the problem with Adventure games (perhaps not so much with current Adventure games) is this pixel-hunting scenario where you feel you’ve exhausted all of your available options that make sense and your only recourse is to brute-force your way through a problem by clicking anything and everything on the screen. Instead my problem was that I had perceived a scene to have reached it’s end, when in fact it lead to another area. That probably cost me thirty minutes as I had initiated my pixel-hunter mode when I shouldn’t have. Outside of that one hiccup that was caused by my misinterpretation of the game’s intent, the puzzle dynamic to The Last Door is well balanced and, to a degree, practically makes the story more important than puzzle mechanics. The dripping water sound is truly terrifying. Which leads us to the story of The Last Door. You play as Jeremiah Devitt, a man from the late 19th century living in England who is looking for answers about his past catalyzed by the suicide of a childhood friend. 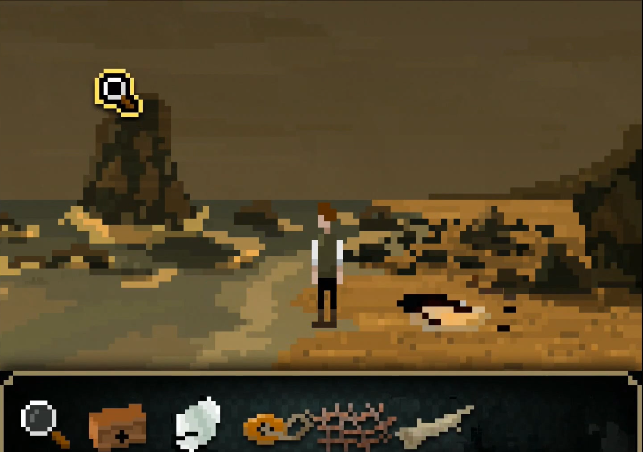 The first episode of The Last Door (which is free and you can play here: http://thelastdoor.com/index.php/chapter/1 ) centers around the discovery of what happened to your friend as you travel to his home in Sussex. Throughout both episodes there are a few themes that continue to crop up. Of all the themes, ‘eyes’ are heavily linked between the episodes I’ve gone through and play a key-role in pushing the story forward. Overall, each episode averages around an hour depending on the degree to which you get stumped. For reference the first episode took me around thirty-five minutes and the second episode took me ninety. TL;DR: The visual style along with the anti-enigmatic puzzles leads to a (practically) frustration-free horror-adventure game that lets you fully enjoy the entirety of the presentation. The block-y pixels almost force you to hone into the superb audio soundtrack, clearly a polar opposite to today’s gaming industry that focuses on graphics first, yet doubles as a guiding mechanism for the player. It’s also worth mentioning (omitting one instance) that The Last Door strays away from tacky jump-scares and instead focuses on the complete package to cause tension. All the parts working in unison while avoiding tacky shortcuts will keep you steeped in the game’s narrative and offers an extremely refreshing take on old genres. Verdict 10/10: Each element of The Last Door can perfectly stand on its own merits but when combined is a tour de force, if a bit on the short side.